You’ve probably heard of Lyme disease. You or someone you know may have even tested positive for it, but did you know that your furry friend is just as at-risk for exposure to this dangerous disease as you are, maybe even more so? Fortunately, cats are not at risk for acquiring Lyme disease, but as we now know, their canine counterparts certainly are. Research indicates that in 2016 and 2017, 1 in 8 dogs in Roanoke County tested positive for Lyme disease. In 2018, 1 in 9 dogs in Roanoke County tested positive, an improvement from previous years. It may seem hopeful that perhaps the tick population in our area is now less than what it was in previous years, however we strongly believe fewer dogs have tested positive for Lyme disease because of increased efforts to prevent disease transmission, like vaccination and year-round flea/tick prevention. So what exactly is Lyme disease and how can you protect your dog? We’ll answer these questions and more in this blog post! 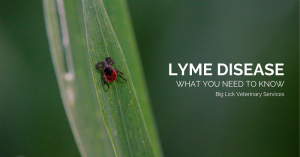 What is Lyme disease and how is it transmitted? Lyme disease is an infectious tick-borne disease that is transmitted when a deer tick (also known as Ixodes scapularis or black-legged tick) infected with a spirochete bacteria called Borrelia burgdorferi feeds on a dog, person, or other mammal. Typically, 50% of adult deer ticks are infected with this Lyme bacteria. These ticks are extremely small, ranging from the size of a grain of sand to the size of a sesame seed. Black-legged ticks prefer to hide in shady, moist ground litter, but they can be found above ground, clinging to tall grass, brush, shrubs, and low tree branches. They also inhabit gardens and lawns, particularly at the edges of woodlands and around old stone walls, where deer and white-footed mice, the ticks’ preferred hosts, thrive. Over 90% of infected humans show signs of Lyme disease and the initial signs of the disease in humans are typically the classic bull’s eye lesion and flu-like symptoms. In dogs, on the other hand, clinical signs of Lyme disease are observed in only about 5-15% of infected cases. When early signs do occur, they typically occur about two months after infection. What are signs of Lyme disease in dogs? When dogs do show signs of Lyme disease, they typically present with shifting-leg lameness, arthritis in one or multiple joints, enlarged lymph nodes, lethargy, and/or fever. Skin lesions are rare in dogs, though some do have a bull’s eye lesion for a few weeks after a tick bite. What are the effects of untreated Lyme disease in dogs? In addition to the symptoms discussed above, some dogs also develop kidney problems when left undiagnosed or untreated. Lyme disease sometimes leads to Lyme nephritis, which is inflammation and dysfunction of the kidney’s glomeruli (a blood filter). Eventually, kidney failure may set in as a dog begins to exhibit signs of vomiting, diarrhea, weight loss, increased urination and thirst, and abnormal fluid build up. Unfortunately, Lyme nephritis can be fatal. How do you test for Lyme disease in dogs? Here at Big Lick Vet, we recommend preventatively testing for Lyme disease at least once a year. The yearly labwork we recommend for our patients includes a Snap 4dx, which is a test that informs us if a dog is positive or not for Lyme disease and also tests for heartworm disease and several other tick-borne diseases, like Anaplasma and Erhlichia. What do I do if my dog tests positive for Lyme disease on a Snap 4dx? If your dog tests positive on a Snap 4dx, we recommend doing a test called a Lyme C6 titer. This is a titer level of the C6 protein from the surface of the Borrelia organism. This test differentiates those dogs whose infections need to be treated from those whose titers are so low that they are clinically insignificant. Titers above 30 are considered to be significant and dogs with titers above 30 should be treated even if no clinical symptoms are apparent. As we mentioned above, 5-15% of dogs with Lyme disease show no symptoms. Titers do not become elevated immediately after tick bites and it may take 2 to 3 months for the titer to rise. We recommend yearly bloodwork because it not only includes a Snap 4dx, but also include a blood chemistry panel. We recommend checking a blood chemistry panel because we also want to determine the condition of your dog’s kidneys. We recommend this due to the above-mentioned condition called Lyme nephritis. We also recommend doing a urinalysis to evaluate your dog for possible kidney dysfunction and to look for evidence of infection, inflammation, concentration of urine, and protein loss in the urine. We recommend treating your dog for Lyme disease if they have a positive Snap 4dx and a C6 titer over 30 with an antibiotic called Doxycycline. We typically recommend treating for 30 days and most pet owners see an improvement in their dog’s symptoms within about 3 days. We recommend rechecking a Lyme C6 titer six months post-treatment to determine if treatment was effective. We are looking for the titer value to be about half of what it was before treatment. Dogs that are infected may test positive for years to come. There are several things you can do for your dogs that will help prevent Lyme disease. Using year-round flea/tick prevention.There is a misconception that ticks are not a concern during the wintertime, however ticks are indeed a year-round pest and in order for your dog to always be protected, year-round flea and tick prevention is recommended. It typically takes 48 hours for a tick to transmit Lyme disease after biting and the flea/tick prevention we recommend will kill any tick that bites much sooner than that. There are several different products available right now. Frontline Plus, a topical flea and tick medication, is a liquid applied between the shoulder blades that lasts for approximately one month. Bravecto, a chewable flea/tick preventative, is our personal favorite for protection from tick-borne diseases. Bravecto is given only once every 3 months by mouth and therefore doesn’t wash off or loose efficacy if your pet gets wet. Vaccinating for Lyme Disease.While there is no vaccination for people, there is a vaccine for your canine companion. The initial vaccination must be boostered approximately 3 weeks after it is first given and then becomes a yearly vaccination. It is a highly efficacious vaccine in preventing the transmission of Lyme disease. Testing for tick-borne diseases yearly.The annual bloodwork that we recommend includes a Snap 4dx, which will test for Heartworms, but also Lyme Disease and two other tick-borne disease – Ehrlichia Canis and Anaplasma. If your dog has tests positive for Lyme Disease, our staff will discuss treatment options with you and determine what the best course of action is for your pet. We appreciate you taking the time to learn more about Lyme disease, how it can affect your pet, how you can prevent it, and how you can treat it if your dog becomes infected. If you have any questions about Lyme disease or your dog’s Lyme disease prevention protocol, please call our offices at 540-776-0700. We’re also excited to inform our clients that this April and May are Lyme Disease Awareness and Prevention Months and Big Lick Vet will be raffling off a Roomba! The raffle will start on Monday, April 1st and end on Friday, May 31st and the winner of the raffle will be drawn on Monday, June 1st. You can receive raffle tickets by taking steps to prevent Lyme disease in your dog, like vaccinating for Lyme disease and obtaining flea and tick prevention. See below for additional details.